Thrina Lysell was a teacher at Fruntimmersföreningens school for girls in Gothenburg. Thrina Lysell was born in Varberg in 1764. She was the daughter of master cooper Nils Holm and his wife Christina Lundström. Nothing is known of her education. One of her brothers became a priest, which implies that there were opportunities for learning within the family. Thrina Lysell married Anders Niklas Lysell, an inn owner, and later commercial bookkeeper. In 1795 he took over an inn with a haulage contractor firm in Gothenburg. By 1802 he had to sell the business due to growing debts. He went bankrupt in 1815, at which time he had debts incurred in the well-known “Hallska massan”, which concerned the bankruptcy of wholesale merchant John Hall the younger. Anders and Thrina Lysell had three children together, Nikolaus, Anna, and Carolina. After a period of ill health Anders Lysell died in 1818. Napoleon’s continental blockade imposed against Great Britain had given rise to a unique economic boom in Gothenburg during the years 1807-1814. However, the financial crisis which followed the lifting of the blockade subsequently caused a deep economic depression for the town, particularly between 1815 and 1819. A great rise in unemployment and bankruptcies ensued, particularly hitting those citizens whose livelihoods were trade-related. As a result of bankruptcy and the subsequent death of her husband, Thrina Lysell was forced to seek gainful employment as a teacher to provide for her family. By 1815 she had already been hired by the newly-established Fruntimmersförenings (women’s association) school for girls, and both of her daughters assisted her in her work from the outset. For a long time these three women were responsible for the majority of the teaching at the school. The school had been established through the setting up of an ”Association af Fruntimmer” (association of women). The school’s remit was to impart “an unaffected and thorough education to the daughters of people of rank and functionaries within Gothenburg town, who are in need of these benefits”. The goal was to assist those families which were unable to provide their daughters with the appropriate education relevant to their social standing due to the economic downturn. Initially the school was called “Pensionsinrättning för fattiga flickor” (a pension foundation for poor girls) and operated without fees. When the school started it only had a few pupils but it really took off in 1819 once several of the town’s wealthy women promised to provide a fixed annual sum. Younger women from the same social class were encouraged to produce handicrafts to be auctioned on behalf of the school board, or to serve as raffle prizes, in order to ensure the school’s survival. Well-known gentlemen, such as doctor Pehr Dubb and Bishop Carl Fredrik af Wingård supported the school, but the majority of the school board consisted of women who were actively involved in the enterprise. The teaching was initially limited to those skills which were required in “a frugal home”, namely knowledge of Christianity, writing, counting, basic sewing, baking, and brewing. The ages of the pupils was set between 6 and 12. In 1824 Queen Desideria declared that she wanted to become the school’s patron. During the 1840s and 1850s the school’s financial status became more stable through an increase in donations. Classes at Fruntimmersföreningens school for girls were held at Thrina Lysell’s home at Vallgatan 24. She and her daughters did all the teaching except for Christian knowledge lessons, for which they had the support of a priest. In 1825 Thrina Lysell applied for permission to teach at least 18 girls in order that she “could in such a way earn a full month’s wages to provide for herself”. Permission was granted in 1826 and the following year the number of pupils was set at 24, along with a fee per student of two riksdaler per month. 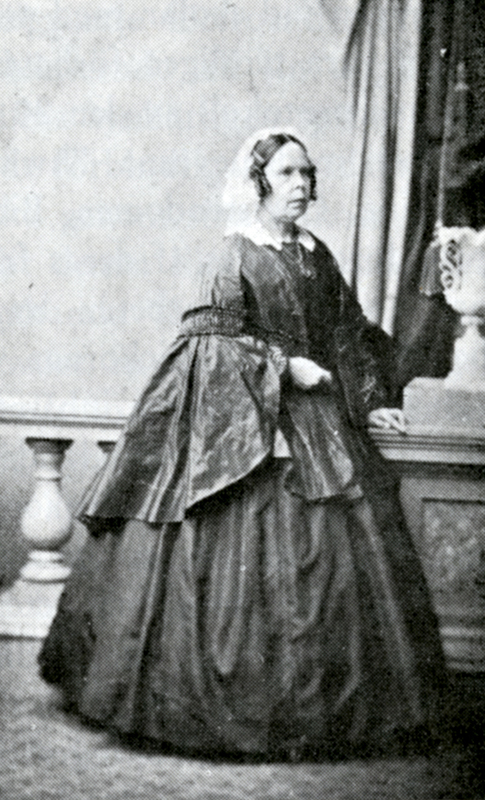 Thrina Lysell’s daughter Carolina replaced her as director of the school in 1830. In 1850 the governing board awarded Thrina Lysell and her daughter a bonus of 50 riksdaler banco. Eight years later, in 1858, Carolina Lysell was given a golden medal for her 43 years of service. Cathrina (Thrina) Lysell, www.skbl.se/sv/artikel/ThrinaLysell, Svenskt kvinnobiografiskt lexikon (article by Louise Lönnroth), retrieved 2019-04-23.